Yoni Dvorkis, MPH, CHDA is a Data Consultant with nine years of experience in health care, data analytics, information technology, and health informatics. He is a key member of the Department of Population Health at Atrius and is certified as a Health Data Analyst by the American Health Information Management Association. 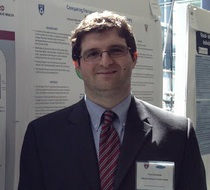 Yoni received his Master's in Public Health from the Harvard School of Public Health and his Bachelor of Arts in Mathematics with a minor in Economics from Tufts University.